Famous for its skincare industry and medicinal mineral baths, Hungary is home to mineral-rich thermal waters, from hot springs in the Carpathian basin that offer healing benefits prized for over 2,000 years. Today, medical practitioners prescribe bathing in Hungary’s healing thermal waters to treat numerous ailments. Based on her extensive European and American training, Eva has developed her own unique techniques of care that leave skin rejuvenated, healthy and glowing. Here are some of her signature therapies based on Hungarian traditions. This facial combines the remarkable effects of Hungary’s mineral-rich thermal waters with the science of mineral cosmetology, a delivery system that enables a potent blend of minerals to be absorbed by the epidermis and dermis to cleanse, nourish, protect and restore the skin’s natural balance. Each treatment is individualized for the client’s skin type and is ideal for men and women of all ages. The 80-minute treatment includes an LED light therapy and a relaxing scalp massage to relieve tension. Regular skincare makes a man’s face more handsome. With this in mind, cleansing and exfoliation with lightly scented natural products prepare the skin for extraction. A mineral-rich Hungarian thermal mud mask draws out impurities, cleans deeply and nourishes the skin. 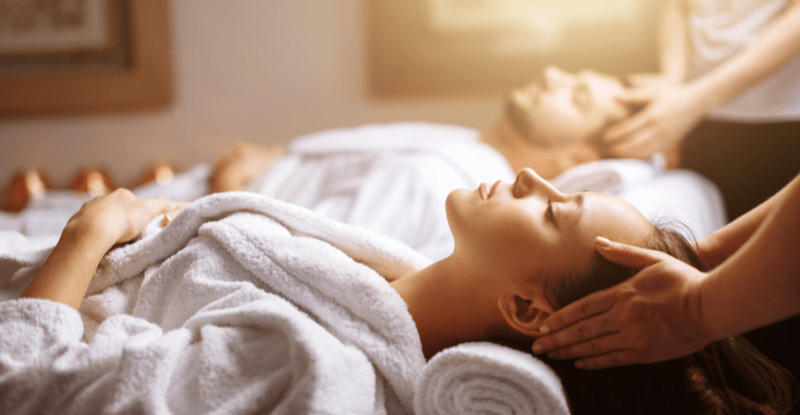 A unique Hungarian facial massage soothes the skin and stimulates microcirculation, followed by a scalp and shoulder massage to relieve tension and stress. This luxurious, nourishing facial is full of anti-aging benefits. It begins with a copper enriched, lactic acid peel with collagen-boosting agents; followed by a 24-carat colloidal gold serum that soothes with its anti-inflammatory properties. Followed by a unique plumping Hungarian facial massage that activates hydrating micro-spheres in the skin to reduce the appearance and depth of fine lines and wrinkles. To finish, a sprinkling of gold oil repairs the skin resulting in shimmering arms, hands and décolleté. This restorative firming and brightening facial helps renew aging skin. Its diamond-infused peptide complex and special ingredients prolong the healthy life of the skin cells. It helps to increase firmness, collagen and elastin production and stimulates oxygenation and creates a youthful, instantly lifted, long lasting hydrated skin. REJUVENATING EYE TREATMENT – This eye treatment uses the herb Arnica and Vitamin K to remove puffiness and dark circles. A gentle massage, with cooling eye pads, soothes and relaxes the eye area for eyes that are brighter and refreshed. NECK & DÉCOLLETÉ REPLENISHING TREATMENT – A brief plumping massage to reduce the depth and appearance of fine lines and wrinkles in the delicate skin of the neck and décolleté area. A gold-enriched oil is used to heal and repair the skin, leaving it radiant and glowing. OXYGEN TREATMENT – Any facial can be updated with a stream of pressurized oxygen to make the skin visibly smoother and more youthful. The oxygen penetrates the skin below the sub-surface and helps hydrate it. The skin will be significantly softer with less visible fine lines and wrinkles. Special event and bridal makeup available. We specialize in preparing brides and grooms for their big day. Service packages are include: Facials, Spa Body Treatments, Massages and Makeup. We offer onsite makeup service to give you a glow for your special wedding day.